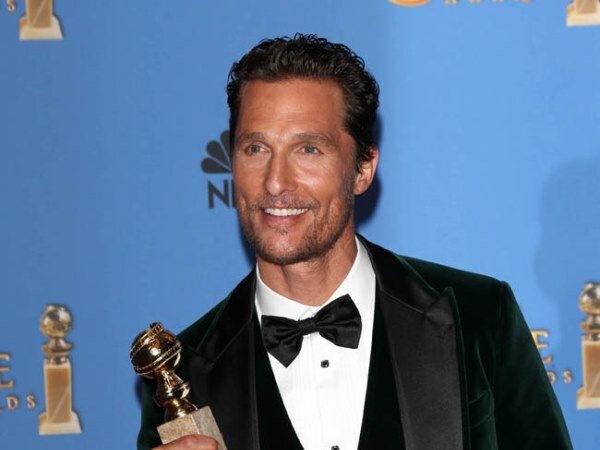 Well, that must have inspired confidence - Matthew McConaughey has revealed his five-year-old son Levi was convinced he wouldn't win the Best Actor prize at the Golden Globe Awards. The Dallas Buyers Club actor's five-year-old son Levi - who he has with wife Camila Alves - didn't think he would be able to beat the likes of Chiwetel Ejiofor and Tom Hanks to win the Best Actor prize and he now intends to gleefully flaunt his trophy to his offspring. Quizzed if he had any good luck charms, Matthew told Entertainment Weekly: "I have so many good luck charms, I don't even know most of them. Camila and I were explaining to the kids, 'We're going up and there were five other male actors' and that they'd nominated me for Best Actor. "My son was like, 'I really hope you win, but you're going to lose.' Maybe that was my charm? Now I have to get that little son-of-a-gun and go, 'Ha, ha, ha!' "
Matthew has enjoyed a career rejuvenation in recent years with a string of critically acclaimed films such as Dallas Buyers Club and Mud, but his family remain the most "interesting" thing in his life. He added: "My life, outside of my career, is extremely interesting to me." The 44-year-old hunk paid tribute to wife Camila (31) and their three children - Levi, Vida (4) and 13-month-old Livingston - as he accepted the prize for his role as AIDS victim Ron Woodroof in the dramatic new film.